Struggling Gosport & Fareham travel to local rivals Tottonians in search of points to lift them off the bottom of London one south (1pm). The Blue & Golds slipped into the basement spot following their disappointing home defeat at the hands of Maidstone. Neil McRoberts’ team, not for the first time this season, ended up losing after getting themselves into a winning position. With just one win in their opening five league games they are looking to change their fortunes around. ‘It is time for us to put in a performance we know that we are capable of,’ said McRoberts. ‘The two-week break has been good for us and the players have worked hard during this time. 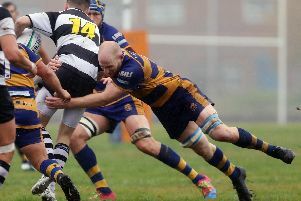 A fiery encounter can be expected in Hampshire one where Fareham Heathens host Locks Heath Pumas in a derby. The Pumas were formed as a breakaway group from Heathens and rivalry is always intense. Heathens coach Bernie Rhodes is adamant his side will retain their discipline and focus. ‘We are expecting our usual tough battle against the Pumas,’ said Rhodes. ‘Two seasons ago when we were last in the same league they did the double over us. ‘That was because we lost our discipline. Rhodes has a full-strength squad to choose from with back-row forward Matt Smith and three-quarter Ryan Keary returning to the fold. Pumas coach Nathan Moore expects a tight game. ‘This is the game on the calendar players always look for first,’ said Moore. ‘There is a bit of history between the two clubs. ‘Both teams will be going at it with everything they have got and I am expecting it to be physical. In Hampshire two Southsea Nomads visit Ventnor.